Estimated costs for decking over the area are anywhere from $350-$500 million and the BP’s office is calling on reaching out to area stakeholders to push forward with a request for proposal for such a project. In the mix are recommendations for several acres to be used to expand Lehman College’s (3 acres), co-op, condos, townhomes, and rental units not to mention community facilities. In the report, it states that decking over the Concourse Yards in Bedford Park can result in 2 million square feet for development over a 13 of the 19 acre area. 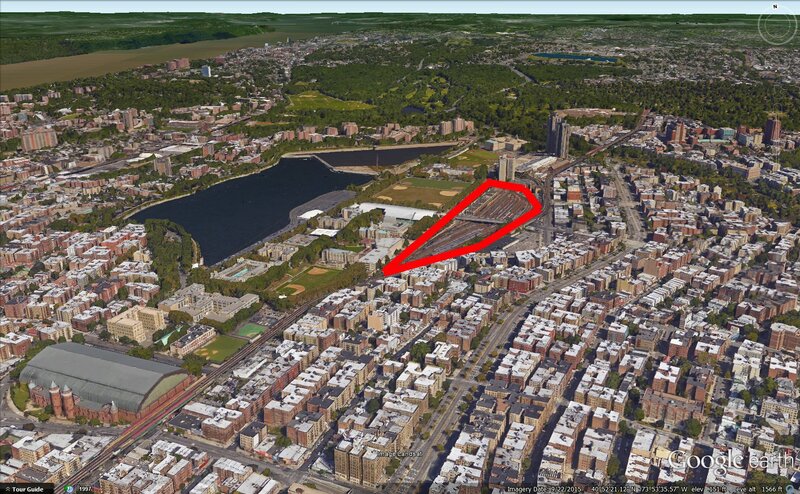 This is a pretty dense proposal for a neighborhood not known for such high density considering all the wide open spaces of Mosholu Parkway, Jerome Park Reservoir, Van Cortlandt Park, Lehman College, and even the very yards we speak of. A neighborhood dominated by mostly 6 story buildings. R6 zonings do not have height limits but are limited by the neighborhood’s sky exposure plane according to New York City zoning regulations. The plane begins at 60 feet from street level and can potentially lead to developments that are more than twice the height of the typical buildings in Bedford Park. Although the area has good transportation connections with the 4, B, D lines proximate to the site, the report fails to study the impact on our transportation system that thousands of new units, not to mention thousands of new residents would have on Bedford Park and the surrounding neighborhoods. In most reports we’ve seen for big developments in The Bronx they speak about our great transportation network but never really delve into the issue that they are already overburdened let alone go into how it will effect our transit system and vehicular traffic. We’re advocates for homeownership as it solidifies neighborhoods but will it be affordable? The same can be asked about the rental housing stock that could potentially occupy the space. We want to hear from area residents, what do you think about this potentially happening in the relatively quiet neighborhood of Bedford Park.